Update: The model that I review below, the Monkeylectric m132s, is no longer available. It has been replaced by the improved Monkeylectric m232 model. I first heard of Monkeylectric last summer, when I met Dan Goldwater in Cambridge to see his then-current prototype. Dan, the force behind it, is a bona fide Maker. Prior to Monkeylectric, he was a co-founder of Instructables, a community site for how-to's and DIY projects. 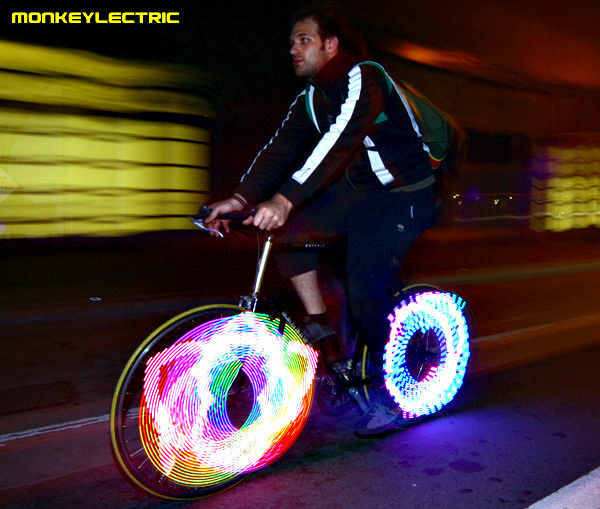 He has contributed a large number of projects there, both LED-themed and bicycle-themed, and the Monkey Light clearly draws on this body of work. Where the Monkey Light differs, however, is in accessibility: It is for sale, already assembled and ready to use. I will compare the Monkey Light to the Hokey Spokes based on the three criteria that I believe to be most important to the bicycle commuter: enjoying the commute, practicality, and staying safe. There's no questions about it: the Monkey Light is fun. Bright colors, in a variety of patterns, constantly changing. Installation does take some time, but you only need to do it once. The included instructions are a bit skimpy, but Dan has posted a detailed guide on Instructables, which I recommend printing out. The unit is attached to spokes with zip-ties, and a set of rubber spacers eliminates any rattling. The Hokey Spokes, on the other hand, rattle incessantly, regardless of how much they are tightened. On the other hand, they were designed to be easily removable (with a screwdriver), and that does advantages over zip ties. I used the Hokey Spokes in the winter, when I ride home in the dark, but take them off in the summer, when it remains light longer. Now that the Monkey Light is zip-tied on, it's not coming off again (unless someone cuts it off.) One suggestion: Before using the zip-ties, think about which side of the bike you stand on more often, and orient the Monkey Light so that the buttons are accessible from that side of the bike. Monkey Lights ship with a waterproof rubber cover for the battery cage, which works just fine. When it comes to bicycle accessories for daily commuting, my preference is generally for road-ready manufactured products over homemade DIY products. Rain, snow, salt, constant jostling, and potholes are eventually unavoidable, and so my bicycle and the things on it must be able to handle that. So while it looks like a great project, I haven't assembled a SpokePOV kit. Aside from the Hokey Spokes, there are other approaches to side-lighting for bicyclists. Commute by Bike reviewed the Pedalite Self-Generating Luminescent Bike Pedals earlier this year, and while it doesn't look particularly bright, it wins points for not requiring any batteries. Hokey Spokes do offer one feature missing from the Monkey Light: multi-unit synching. This is a cool trick in theory, but I found that the IR sensors were often triggered by bright sunlight, and frequently found them already running when I returned to my bicycle at the end of the day (Partially covering the sensors with electric tape solved the problem.) This synching and the fully-waterproof enclosure were two areas that the Monkey Light still lags behind. Perhaps next revision. Summary: If you are concerned about cars not seeing you at intersections, the Monkey Light is a remarkably bright wheel-based light set. The customizability, hackability, and color variations may be unnecessary for a visibility-focused commuter, but hey, they definitely add to the fun. You can purchase the Monkey Light through Amazon. Some great points of comparison. Let me ad that after having used Hokey Spokes for several years and now having added some Monkey Lectrics that while yes, Hokey Spokes do mount with a screwdriver, they must be removed to change the batteries and I've found that having done this dozens of times over their lives, the screws are worn out and on three of my Hokeys, have even been lost. Therefore, like the Monkey Lectrics, they are attached with zip ties as well. I found that attaching the Monkey Lectrics to be easy, fit on wheels smaller than 26 inch and 700c and the ability to install the batteries without removing them from the wheels first to be a huge advantage. They are much brighter than Hokeys and have many more patterns and, unlike Hokeys, are able to do many colors with one unit. Hokeys require you to choose a color when you buy them, Monkeys allow you to choose your color or cycle through all the available colors (many more than Hokeys) with the simple press of a button. I'm done with Hokeys and have switched to Monkey Lectrics. No doubt, the makers of Monkey Lectrics will improve the design in the future and ad more features, but even as they are shipped today, have many advantages over Hokey Spokes. 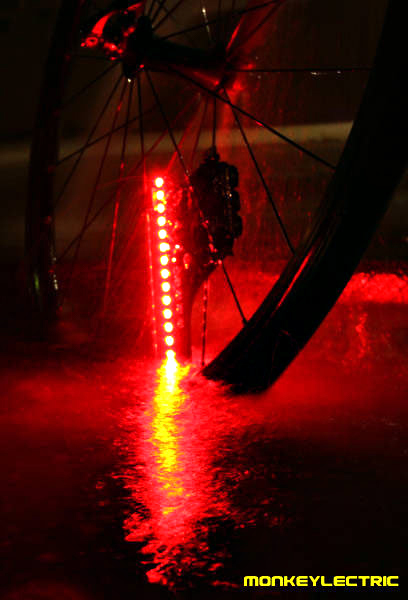 I am very like anvii LED Bicycle Wheel Lights. It can program text message and draw your pattern on pc. I was just looking into getting the monkeylectrics, your blog was super helpful in giving me all the extra info, Thanks so much! Hi Dan, thanks so much for offering the coupon towards monkeylectrics! Just wanted to let you know that since they have a new model the discount is really 10% not 25% so you may want to change this posting. after bought anvii lights, hokeyspokes, monkey lights. I enjoy the functions of anvii lights the most. It allows me to draw own patterns. Both hokeyspokes and monkey spokes do not have this function. The installation of anvii is quick simple. Though, you need to get to know how to do it at the begining. I have one Monkey Light that I bought for $65.00 (compared to $29.95 for Hokey Spokes). They are heavy and when you attach them to your wheel it throws your wheel off balance. If you try using two of them to balance the wheel, you get a gibberish image because they are not in synch. Hokey Spokes use infra red to communicate with one another. You can balance the weight and don't feel like your wheel is out of balance. Hokey Spokes are waterproof and shock resistant. The new design addresses the IR coming on from random signals. But the best thing to like about Hokey Spokes is the customer service. If you have a problem you can call them and they will answer the phone to address your questions. Did you ever notice that Monkey Lights do not give you a number to call or an email address to send questions. What they are saying is, "You're on your own, kiddo!" When I call Hokey Spokes I get to talk with a real person, there to help me with the product. Before you do business with some company, make sure you can call them. Make sure they give you a phone number to call. Make sure they back up their product with technical support. As for Monkey Lights, I guess they don't have a real office in the jungle. I'll stick with Hokey Spokes for a lot of reasons! Tell those MonkeyLectric guys that if they can get their product to sync together, FAR more durable, and lower the price as much as they can. And then I might be able to consider purchasing 4. Otherwise it would be nice if they had a more "step down" model (perhaps with less patterns and/or colors? ), so that poor commuters can still pimp out their bike. It's an almost great as can be product, I'm glad they continue updating things. It shows signs of ingenuity. I love the idea, but I'm just a mere student. I can't dish out $200 bucks out of nowhere. Great review! Thanks for the info. I was looking between the Hokey Spokes and MonkeyLectrics. I'm riding a roadbike and tried a few spoke light that comes to the market. First i thought i'm lucky that i came across this monkeylight. Doon after i tried it for a week and i got the same problem with power button that i could not turn it off and i frel terrible to remove battery off everytime i get off my ride. It happens to both models so i switched to another brand and just keep these monkeylights in a drawer. How many different ways can you misspell "accommodation"?